It’s always great to get together with my Piedmont tasting group, which includes the legendary Il Professore and a handful of equally passionate lovers of food and wine. This fabulous dinner at La Rei, in Serralunga, featured a number of oddball rarities, some of which I had never tasted. One of my friends dubbed it ‘The Night of the Forgotten Labels’ and it stuck. Our dinner is sensational, even if wine is center stage. 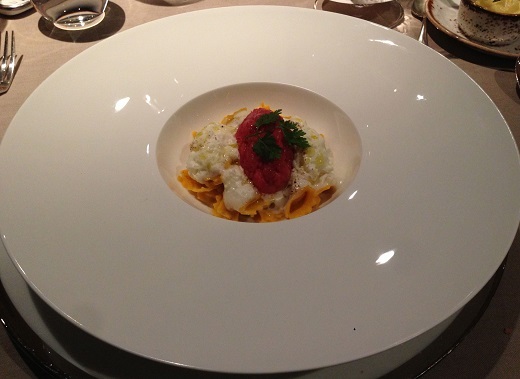 Now that celebrity chef Antonino Cannavacciuolo is consulting on the menu, some of the dishes are a bit more creative than they were in the past, but I find it best to stick pretty close to the classics, especially for the sake of enjoying these pristine older gems. I start with the Agnolotti al Plin, ‘Genovese’ style, which are filled with braised onions and topped with a dollop of carne cruda, a combination that works beautifully. 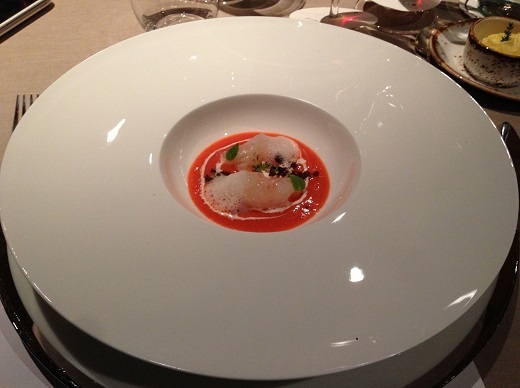 The turbot main course is delicious, especially with the older wines, where the textures of both are nicely matched. I don’t have too much of a sweet tooth, but the small assorted desserts that accompany coffee are impossible to resist. Maître d'hôtel Davide Ostorero and Sommelier Andrea Ostorero (who come from the same town but aren’t related) did a fabulous job with the service. Dinner starts with a glass of Krug ‘s 1988 Vintage, which is at a glorious peak of expression. Fully mature, but showing no signs at all of decline, it is an absolutely beautiful Champagne to drink right now. There are plenty of warm, oxidative Krug signature in the glass, but today the 1988 has developed into a subtle, gracious Champagne that impresses for its balance and overall sense of harmony. What a great way to start the night. Well, there aren’t too many dinners where Giuseppe Rinaldi’s 1979 Barolo is the first red of the evening. The 1979, from a largely overlooked vintage, is gorgeous today. Sweet tobacco, rose petals, licorice, dried herbs and mint waft from the glass in a beautiful, eccentric Barolo long on personality. In this era, the Rinaldi Barolos were much more quirky than they are today. Still, this bottle provides endless fascination and conversation. The aromatics could be a little cleaner, but the wine is like silk on the palate. A true rarity, Giacomo Conterno’s 1970 Barbaresco is totally wild. This is the last vintage of the Barbaresco, and a wine I have never tasted before. The 1970 is sauvage and unrestrained, yet compelling in its own way. This won’t go down as one of the all-time great Conterno wines, but it is certainly intriguing. Sadly, there are no records of where this fruit was purchased. Hints of smoke, tobacco, licorice and dried herbs swirl around the finish. The 1998 Barbera d’Alba Codana from Mauro Mascarello, a last minute addition, turns out to be one of the most intriguing wines of the night. Rich, layered and explosive, the 1998 boasts tremendous density and complexity for a 15 year-old Barbera. What a gorgeous wine this is. If forced to pick my all-time favorite Gaja wines, the 1971 Gaja Barbaresco Sorì San Lorenzo would be at or near the top of my list. Great bottles are still powerful and full of life. Sadly, this is not one of those bottles. Texturally beautiful and silky on the palate, the 1971 is very pretty on its own terms, but just a shadow of what it can be. The wine of the night is arguably Montervertine’s 1985 Montevertine. A wine that takes several hours to uncoil, the 1985 leaves everyone at the table speechless. What a great, great wine. The purest and most exquisite Sangiovese nuances lift out of the glass in a breathtaking wine of the highest level. Rich, explosive and complex, the 1985 still has a lot to say. Readers who still own this wine are in for a real treat. Wow. The combination of power and finesse is classic Montevertine. 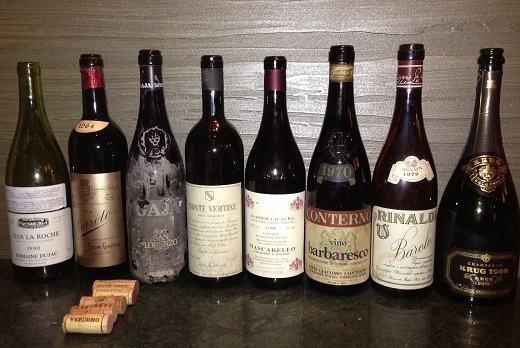 Another wine I have never tasted, Bruno Giacosa’s 1964 Barolo also leaves a deep impression. I have had the Riserva, but not this bottling, which appears to be a straight Barolo. Still in great shape, the 1964 is showing beautifully for a wine of its age and era. The sweet floral, tobacco, spice and plum notes are totally captivating. Dujac’s 1990 Clos la Roche is a very pleasant last-minute addition to the lineup. The most extraordinary, captivating aromatics lift out of the glass in a stunning Burgundy loaded with class, complexity and pedigree. The wine is insanely beautiful for about the first 30 minutes, but then start losing its persistence and depth. I will remember the 1990 for its first impression, which was utterly captivating. One of the most rewarding aspects of wine is the joy of discovery. Although I have probably tasted more than my fair share of great wines from the Langhe, it is always fascinating to find something new. Wine is a journey that is never-ending.